The Southern Pacific Railroad has a vast history all of its own. 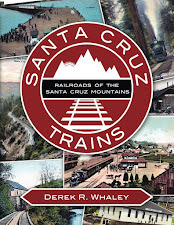 In relation to the railroads in Santa Cruz County and over the Santa Cruz Mountains, however, the history is much more simple and direct. Various railroads merged together to form the core of the Southern Pacific over a long period of time that finally ended in 1996. The actual Southern Pacific, the original independent train line before it became a conglomerate, was founded by Timothy Phelps in San Francisco in 1865 with the simple goal of linking San Francisco and San Diego together via rail. Three years later, the Big Four—Charles Crocker, Leland Stanford, Mark Hopkins, and Collis Huntington—bought out the Southern Pacific. They already owned the famous Central Pacific Railroad and merged the two permanently in 1870. 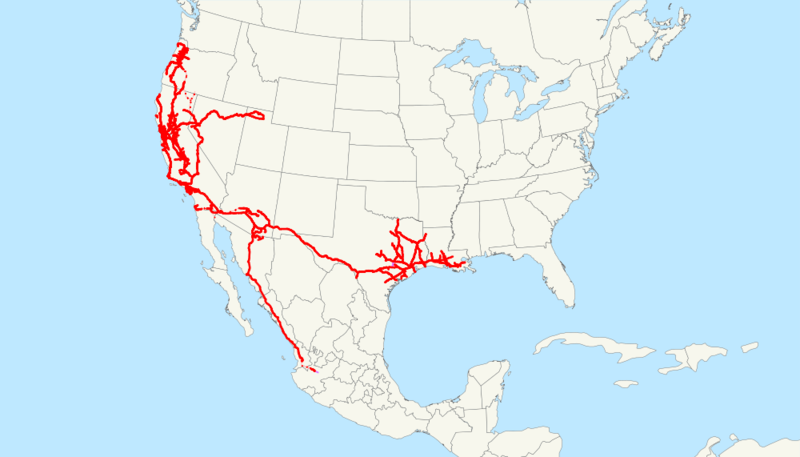 From that date onward, the Southern Pacific grew like a beast, consuming railroad after railroad across California, Arizona, New Mexico, Texas, and other states. In 1883, the Southern Pacific completed the connection with the Galveston, Harrisburg & San Antonio Railway, thereby completing the second transcontinental railroad. The line became the famed "Sunset Route". In 1885, the merger with the Central Pacific was complete and the entire corporation was renamed the Southern Pacific Company, a name it retained throughout its life in Santa Cruz County. Southern Pacific Lines in 1918. 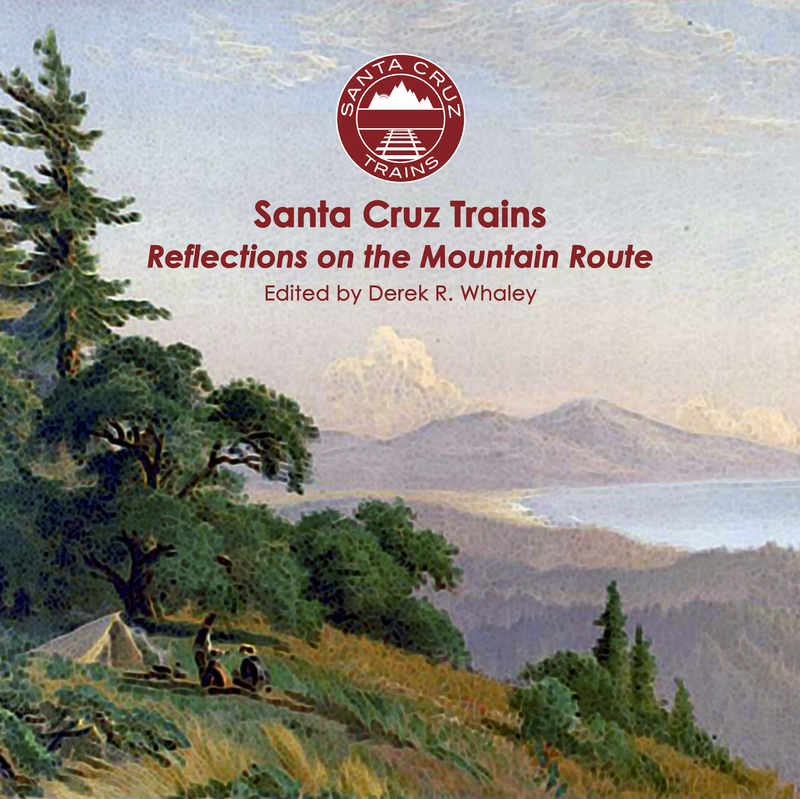 For Santa Cruz, the slow creep of the Southern Pacific began before the railroad was even built. The Santa Cruz Railroad, stretching from downtown Santa Cruz to Pajaro, was built in 1876 in reaction to a lack of interest in developing the route by the Southern Pacific. The completion of that loop by the South Pacific Coast in 1880 temporarily kept Santa Cruz out of the Southern Pacific's grasp, but financial problems by the SCRR forced them to sell their narrow-gauge, locally-built line to Southern Pacific, which then upgraded the entire line over the following years. The South Pacific Coast itself was eventually leased (then sold) to the SPC in 1887 (and 1937) after only a decade of independence, beginning 109 years of SPC rule over the county. In 1907, the Southern Pacific opened a wholly-owned subsidiary named the Coast Line Railroad to ferry freight from Davenport to the SPC network. Passenger and freight service in Santa Cruz declined through the 1930s, with service to Boulder Creek shuttered in 1934 and to Los Gatos in 1940. Passenger service ended in 1959 with the last Suntan Special. From that point forward, only freight went in and out of Santa Cruz County via rail. Meanwhile, the Southern Pacific itself was going through changes. In 1901, the Union Pacific Railroad became the majority shareholder, though the company remained separate. By 1913, the UPRR was forced to sell of its shares of the SPC due to monopoly practices. By 1957, steam engines were completely replaced with diesel engines. 1984 saw the merger of the SPC and Santa Fe Industries under the new name Southern Pacific Corporation. This was only short-lived, though, as in 1996, the Union Pacific Railroad finally was able to merge in the entire Southern Pacific and ended the franchise's life for good. Technically, the UP merged into the SPCorp, but the SPCorp then changed its name to UP and has retained that name ever since. The Boulder Creek Branch operated under the name Felton & Pescadero RR throughout much of its life and can be found under that section.